alaTest a collecté et analysé 25 avis de consommateurs et d'experts pour le produit Pure Digital Neoprene Pouch for Select Compact Camcorders (two pack). La note moyenne du produit est 4.5 sur 5, tandis que les autres Caméscopes ont une note moyenne de 4.0 sur 5. De nombreux avis apprécient la portabilité. 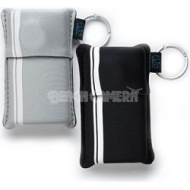 Après analyse des notes de consommateurs et d'experts, de l'âge du produit ainsi que d'autres facteurs, et comparé aux autres Caméscopes, le Pure Digital Neoprene Pouch for Select Compact Camcorders (two pack) obtient un alaScore™ de 82/100 = Très Bien. The pouch is useful for me to contain my headsets and bank cards. I love it very much and would like to recommend it to my friends. "I bought this to give a gift to some o"
Absolutely useful product. 1 was for my flip, the other for a SD 550 Canon camera. This was a great purchase. I use the bag to hold my Canon Powershot and it fits nice and snug. It's made out of strong material and stretchy enough to fit my sister's Sony Cybershot as well. I wish it was waterproof, then it'd be awesome. I was looking for a thin, yet protective case for my camera. I wanted to carry it in my purse, so I didn't want to add any bulk. This pouch was perfect! I don't own a Flip camcorder, but this fit my son's iPod Touch, my iPhone, and our Samsung waterproof camcorder. A great product that is well-constructed.